MASVINGO - A 14 year old girl from Triangle was last week attacked and killed by a crocodile while washing her face along Zineri River. Patience Mutyebere was in the company of her mother Irene Muchiwanga and her 10-year-old brother Emmanuel Mutyebere. Masvingo Province Police Spokesperson Chief Inspector Charity Mazula confirmed the incident which happened at around 5am. Patience decided to go and wash her face a distance from where her mother and brother were. Shortly afterwards she was snatched by a crocodile and dragged into the water as her brother watched helplessly. 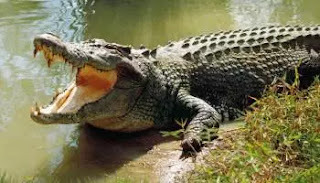 The boy saw the huge crocodile swim downstream with his sister’s body clutched between its jaws. Patience’s mother rand back home and alerted neighbours. The neighbours came to rescue Patience but it was too late, she was dead and the body was recovered. Mazula said that people must be careful especially at water sources like dams and river.